As an experienced Buffalo Injury Attorney, sometimes I get calls from clients regarding injuries or accidents that occur while they’re a bicycle on a bike path. In the last couple years, Buffalo has become on the cutting edge of this biking trend, and we’re seeing more bicycles on the road, but also the motor vehicle traffic hasn’t decreased generally. Because of this, we’re seeing more and more cyclists becoming victims of motor vehicle accidents. If you or a loved one has been struck by a motor vehicle, one of the first things you should do is to try and photo document whatever has occurred. If possible, get names of any witnesses who were around and may have witnessed the incident. If you are injured, or require medical attention, you should try to have somebody else try and collect information for you such as witness statements, or photos of the accident scene before the bicycle is moved, and before the cars are moved. Things like that are critical in a bicycle car accident. Have you or a loved one recently been struck by a car while riding a bike? If so, contact experienced Buffalo Injury Attorney Richard Nicotra. 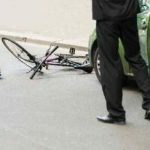 He has represented countless cyclists who were hit by a motor vehicle and has the experienced needed to ensure you receive the compensation you deserve for your injuries. Don’t settle for less. Contact us for a free consultation and let our experience work for you.